Learn more about the basic control configuration in Mario Tennis Aces, including which buttons correspond to each of the game's different shot types. Nintendo Switch owners have no doubt heard about the recent release of Mario Tennis Aces, the latest in a long line of sports titles featuring Big N's most recognizable characters. Of course, players shouldn't be fooled into thinking this a shallow title — there are frankly loads of different approaches that strikers can take in any given scenario thanks to the inclusion of a number of different shot types. Each different type of shot is tied to a certain button or combination of buttons, and mastery of the court involves coming to understand their greatest strengths and weaknesses. Keep reading to learn about all of the essential buttons and the different shot types they correspond with. All of the different shot types in Mario Tennis Aces correspond to a single button or a combination of buttons on the Nintendo Switch Joy-Con. More than that, many of the shots, like Charged or Zone shots, can be used with any basic shot type, like Top Spin, Slice, or Flat shots. The Top Spin shot puts a forward spin on the ball, resulting in a high trajectory with a high bounce. The Flat Shot is a shot without any type of forward, backward, or sideways spin, resulting in a direct line-of-fire return with the highest possible speed. When the ball is returning to the player's side of the court, hold either B, A, or Y to perform a Charged Top Spin, Slice, or Flat Shot. Note that this will slow down the character's movement, so be sure to adjust accordingly beforehand. The drop shot is basically a back spin, where the ball will land toward the front of the court and bounce much lower than other shots. This is generally used to draw opponents toward the net. Trick shots can be used by pressing the right analog stick in the direction of balls that might otherwise be out of reach. 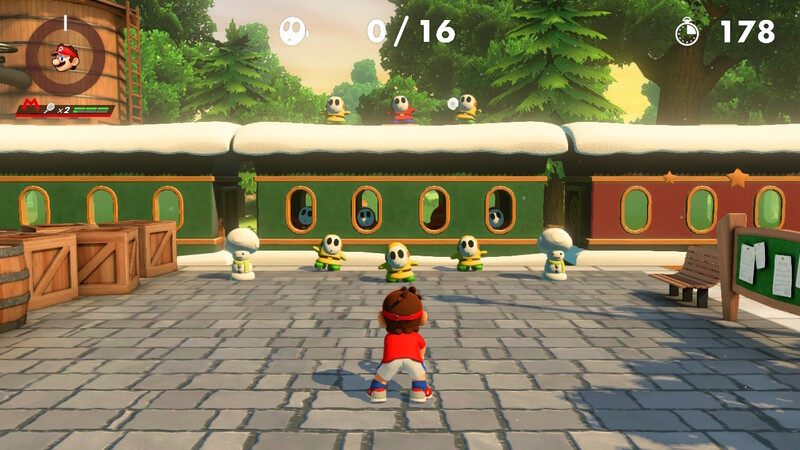 The character will leap toward the ball, and from there, the player can press the button they want to perform any other type of shot. Trick Shots will also fill the Energy Gauge. Zone Shots allow players a brief window in which they can deliberately aim their shot at the expense of using a chunk of their Energy Gauge. Players who have a full Energy Gauge can press L or ZL to perform a powerful Special Shot. It uses the entire Energy Gauge, and carries a chance to break the opponent's racket. When the ball is returning to the player's side of the court, hold R to use Zone Speed to slow down time in order to gain a brief window to line up the next shot. There's a lot more to learn about Mario Tennis Aces, and Shacknews has things covered — be sure to check out our guide to how to perform Trick Shots as well as our guide to all of the characters featured in the in-game roster and their different play styles.